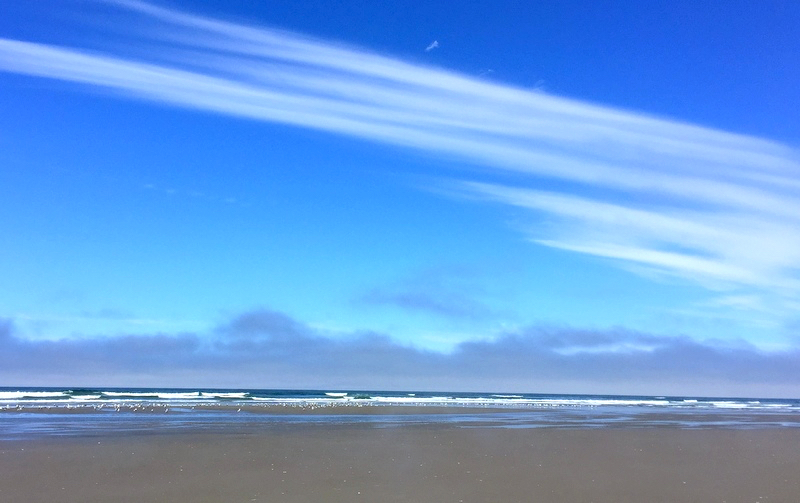 With no plans, no reservations, and no desire to continue roasting in the heat of central Oregon, we made a spur of the moment decision to head to the coast. 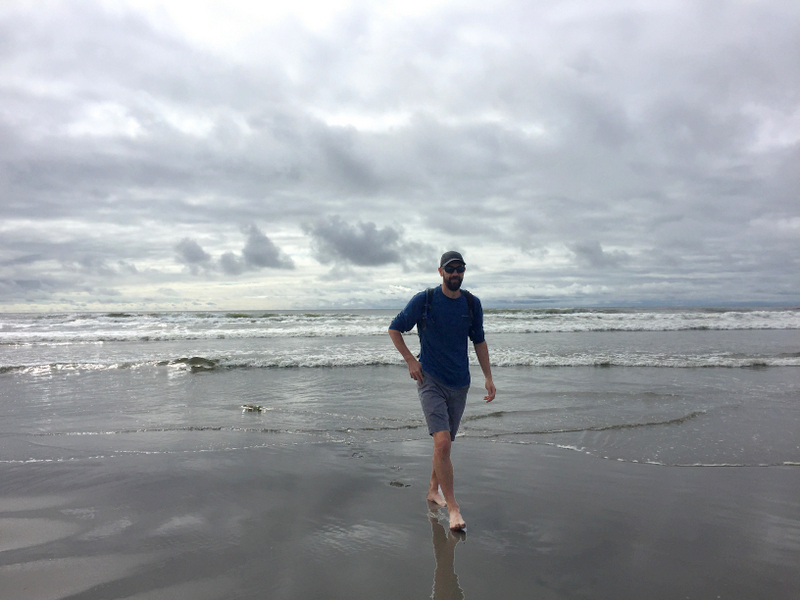 Trying to get into any campgrounds on the Oregon coast at such short notice (think 2 days lead time) proved to be pointless, so we set our sights on a slightly less popular area. 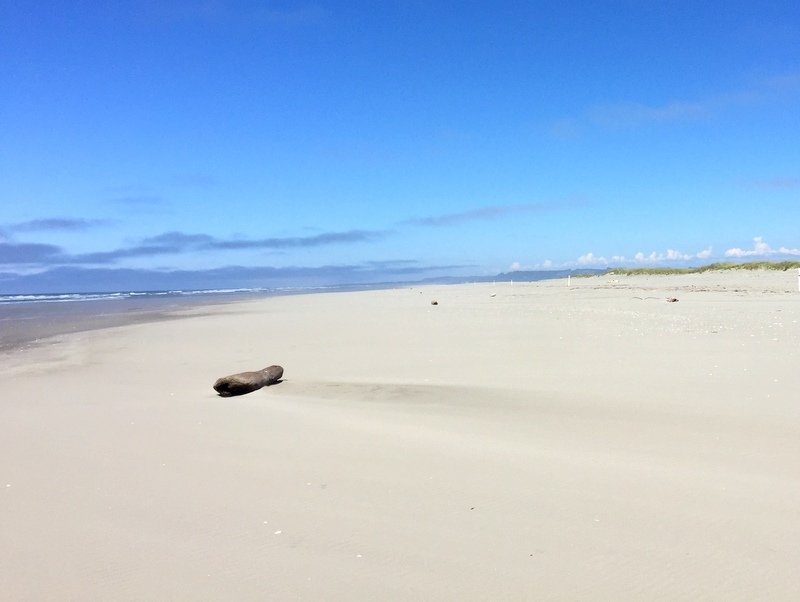 Just north of where the mighty Columbia River divides Oregon and Washington lies Long Beach Peninsula. The beach here is wide, flat, and gorgeous! This roughly 40-mile long spit of land is the home of several sleepy towns, a thriving oyster population, and a gorgeous stretch of coastline that they claim is the “longest beach in the world.” This last bit is not quite true with the honor actually going to the Praia do Cassiono Beach in Brazil, which clocks in at a whopping 150-miles long as compared to Long Beach’s 28-mile stretch. Only a slight exaggeration. False claims to fame aside, the beach at Long Beach is simply stunning. When you can see it that is. Fog is a way of life here and during our 10-day stay, we only saw the sun a handful of times. As a self-admitted sun lover, I will admit that this sudden change from hot and dry (the last time we saw rain was back in June) to fog and drizzle took a little getting used to. Most days started and ended with dense fog accompanied by a light drizzle. If we were lucky, the sun would peak through for an hour or two mid-day, but it never stuck around for long. My hair looks wet because we just walked through 10 minutes of heavy drizzle. I suspect it’s this not quite ideal beach weather that has prevented the area from becoming a crazy tourist trap like so many other coastal areas. The town of Long Beach is probably the most tourist driven of all the towns on the peninsula. The tiny 2-block main street lined with t-shirt shops and ice cream parlors attracts a fair amount of people on a summer weekend afternoon. But compare that to any beach town in southern California, or the entire east coast or the US, and it felt like a ghost town. 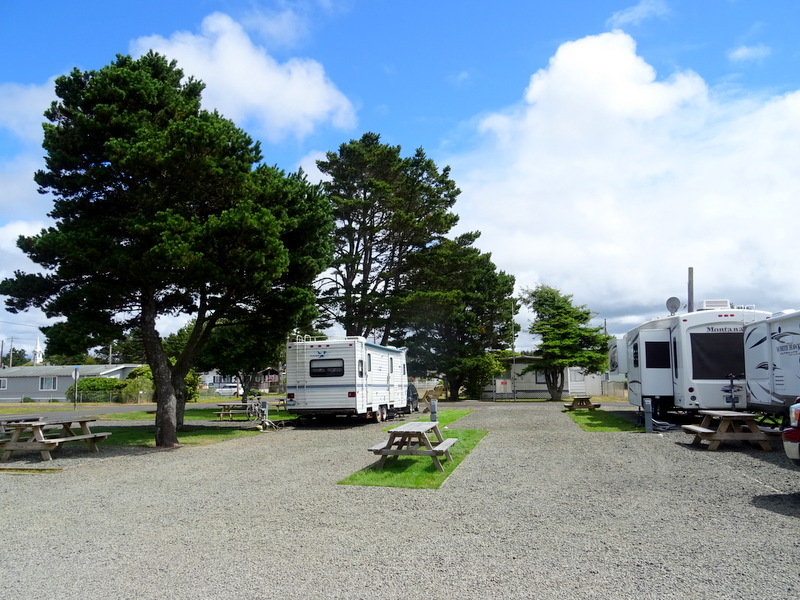 With a large number of RV parks located along the main road, finding a spot to stay on short notice was not a problem. After obsessively reading all the reviews, I picked Sandcastle RV based on the fact that it was within walking distance to both the beach and town. It didn’t hurt that multiple people mentioned how nice the owner was. For once, the internet was correct on both accounts. Sandcastle is right across the road from the dunes and only a 5-10 minute walk to the water’s edge depending on how fast you walk and how far out the tide is. We had this grassy area mostly to ourselves during our stay. The downside was the busy road only steps away. The owner, Don, is also a really great guy. 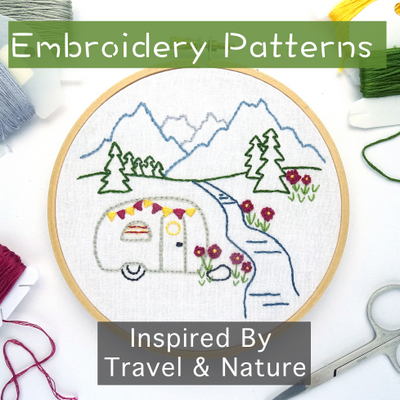 He will tell you that he runs a one-man operation and the pride that he takes in his little RV park shows. 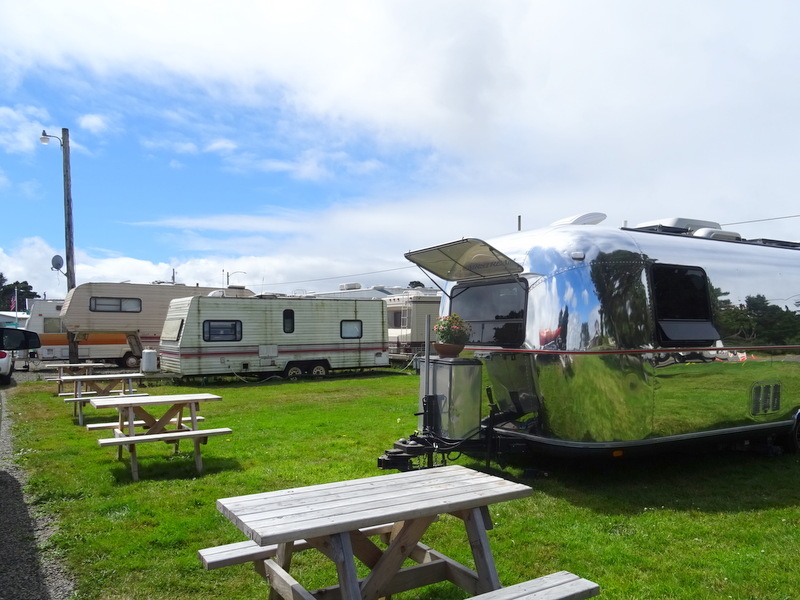 Yes, the sites are tight, the road noise constant, and the half dozen old RVs in the front of the park housing long-term residents are on the unsightly side, but the grounds and facilities were spotless and there is no doubt that Don has the best lawn on the whole peninsula! At its heart, this area is a is a fishing community, and along with that comes an aesthetic that might be a little rough around the edges but also holds an air of unpretentiousness that we found very refreshing. Gravel sites for bigger RVs. They were almost always full. 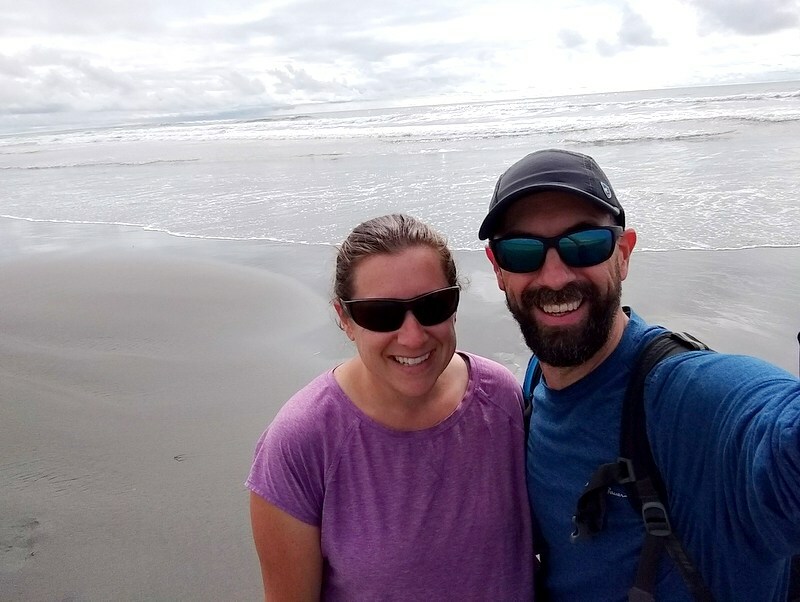 Most of our stay was filled with walks on the beach, walks around town, and a bike ride on the Discovery Trail to see the North Head Lighthouse. We also enjoyed dinner out at the Shelburne Pub with fellow travelers Kerri and Tim who we are fortunate enough to bump into every few months. Per our usual schedule, we had only planned to stay a week, but when an expected important delivery was stalled, we extended two more nights. That meant we had an entire weekend to find adventure with no work and no need to pick up the house and move. We started the weekend with a very, very long walk on the beach. 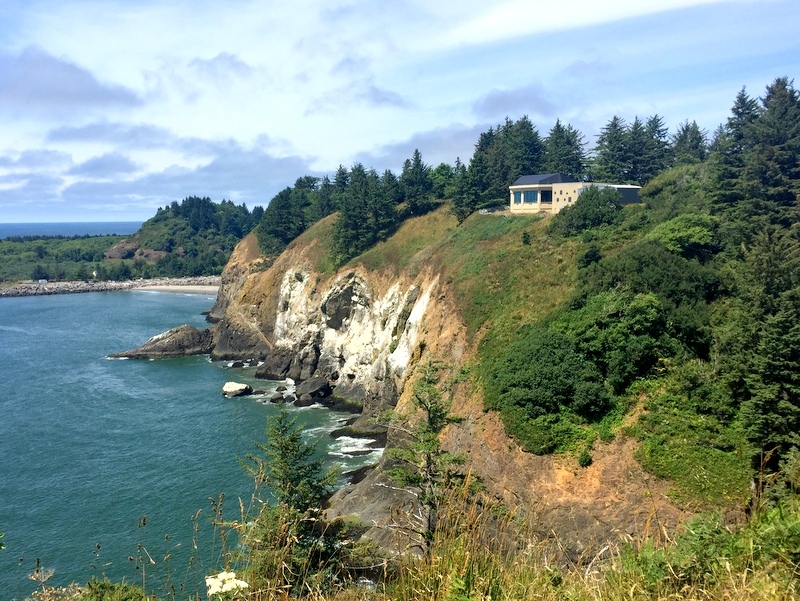 The northern tip of Long Beach Peninsula lies within the bounds of Leadbetter State Park. 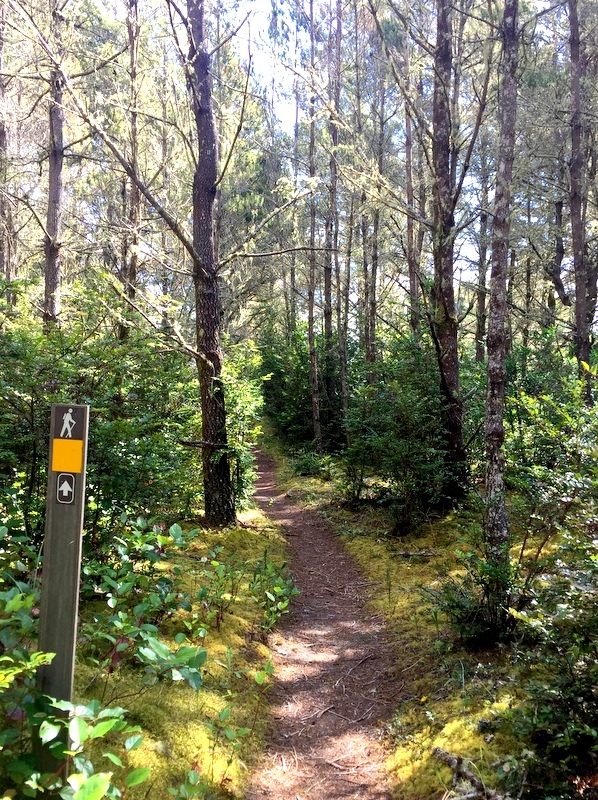 This is one of those state parks where the main function appears to be preserving land (as opposed to recreation) and as a result, it consists of nothing more than a parking lot and some trails that wind through the lowland coastal forest to the beach. After stopping along the way at Jack’s Country Store in Ocean Park to get our Discover Pass (required to enter all Washington state parks) we arrived at the trailhead parking lot around 10 am. 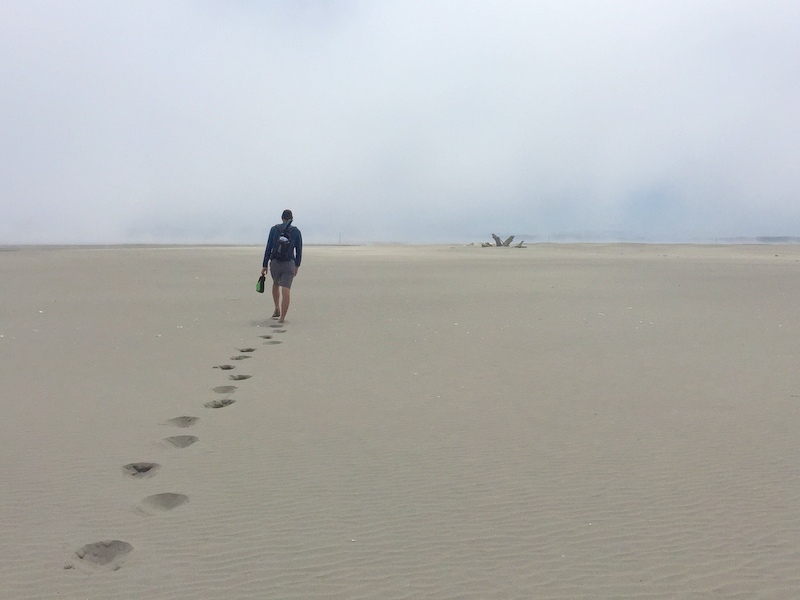 Despite the dozen or so cars in the lot, we didn’t see another person during the two-mile hike to the beach. 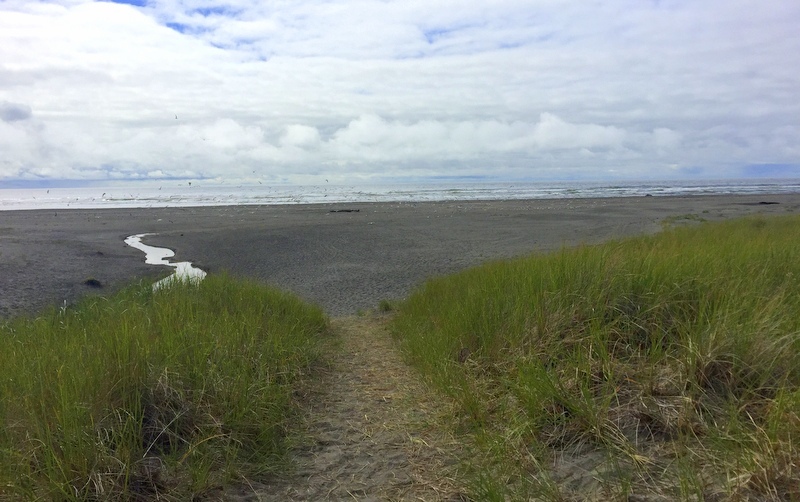 The Bearberry trail led us through the dunes to possibly the most beautiful and serene beach I have ever had the pleasure of visiting. And no one else was there! Our intention was to follow the beach north all the way to the point where the land curls back in on itself. The only way to reach this point is by foot or bike which apparently deters most people. 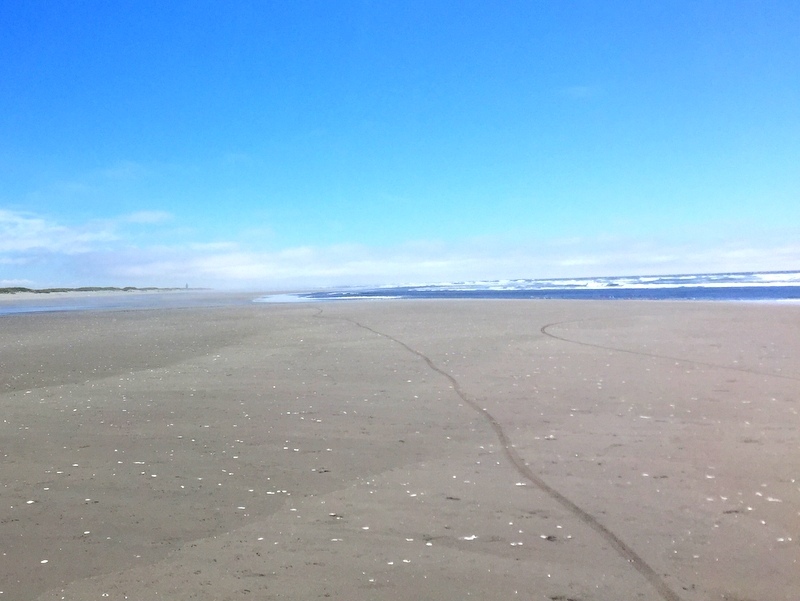 We timed our walk to coincide with low tide, but the beach is so wide I don’t think it would have mattered. Even beyond the high water mark, there was more than enough firm sand for walking. Right away we the spotted masses of broken sand dollars scattered along the shore. I had been on the lookout for intact shells all week and was thrilled when we started finding pristine, whole sand dollars. We picked up a few and before we knew it we had collected more than we could carry. 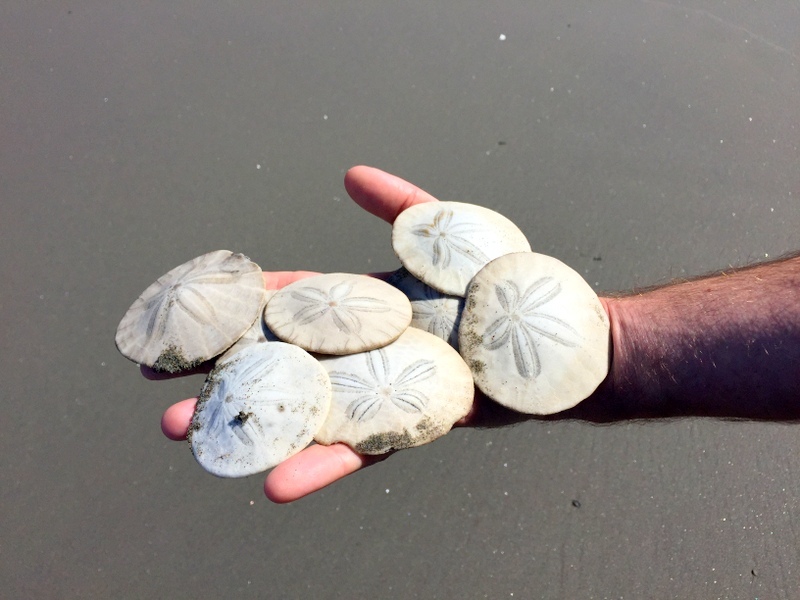 It was a sand dollar jackpot! There were so many that we started only picking up the best of the best and discarding the ones that had the tiniest chip or flaw. For a beach with almost no seaweed, driftwood or shells of any kind (aside from a smattering of crab shells), it was pretty cool to see so many of these fascinating shells. Eventually, we had to get a move on as we knew it was going to be at least a 4-mile walk to the point. As we neared the point, the fog bank that had been hanging just off the water rolled in and surrounded us with a thick layer of moist air. It became hard to see, but we kept walking north keeping the water on our left and the line of snowy plover nesting signs on our right. 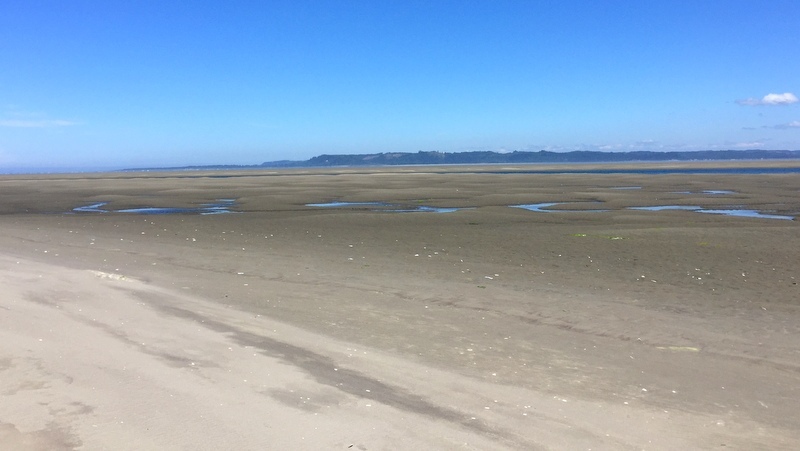 It was hard to tell exactly where we were, but when we came upon a stretch of water in front of us as opposed to off to our left, we assumed this was the point and therefore we were looking at the waters of Willapa Bay. At the tip of the point…at least we think it is. Hard to tell for sure with all the fog. Logic told us that turning right would bring us around the tip of the point. Off in the distance, we spotted a large piece of driftwood and decided that would be a good spot to rest and have lunch. The sand at the top of the point was deep and soft. Not great for walking. Imagine our surprise when only a few minutes after reaching the log the fog suddenly lifted revealing a brilliant blue sky. With our new found vision we could see just how far away we were from the actual tip of the point. Turns out that the water we thought belonged to the bay was nothing more than a tidal river. With all the tidal pools and rivers I don’t think you can even reach the true edge of the shore. Just as we were rounding the tip and starting to head back south we spotted what looked like a person off in the distance. Could it be? Was someone else crazy enough to walk all the way up here? Yup, turns out it was a person. A person on an electric bike. Pretty smart considering that we had to walk 6 miles on foot to get here. I looked into it later and while you can’t bike on the trails in the state park, you can park at the northernmost beach access on the west side of the peninsula and ride to the point from there. Looks like it would be 7 or 8 miles each way. After passing the biker, our solitude continued and we didn’t see anyone else until we got back to the state park. It’s pretty rare to hike anywhere for 12 miles and only see a handful of other people. But when you throw in a stunning beach it becomes even more unbelievable. With what feels like the whole traveling community in a collective uproar over overcrowding, it’s a good reminder that using your feet is a great way to avoid crowds. (As an aside, and because I know some of you are thinking it, I am not even a little worried that by sharing this hike I am ruining the solitude. Why? 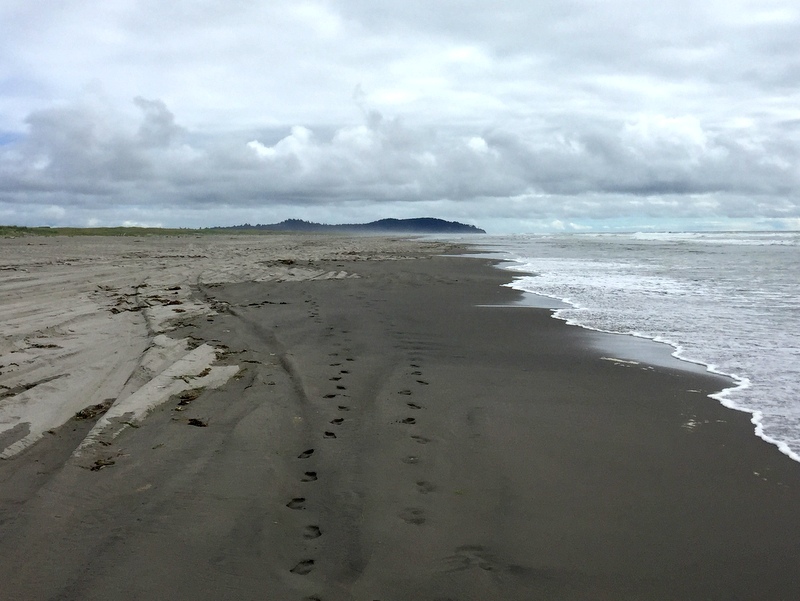 Because I’ve been to a LOT of national parks and I know that most people can’t be bothered to explore past the visitor center much less walk 8 miles on a deserted beach with no official trail). Have you ever seen a beach with such nice sand? 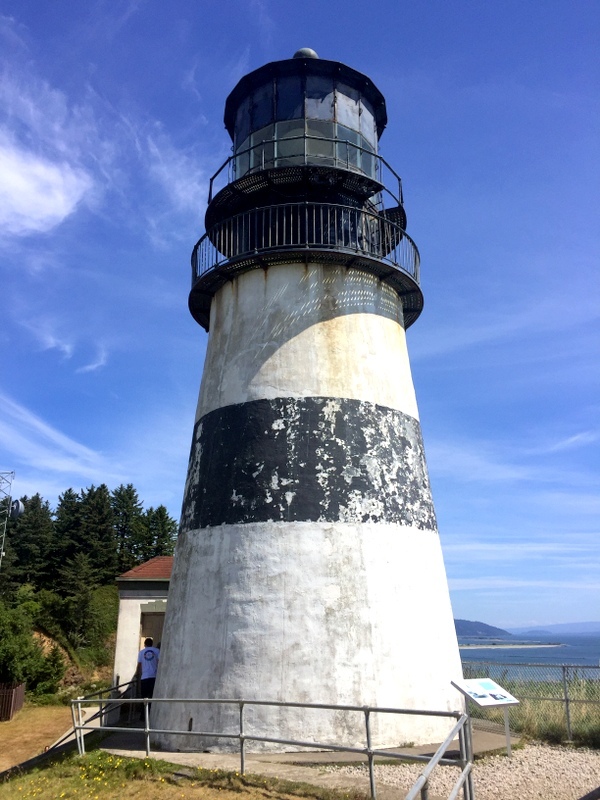 The adventure continued on Sunday with a trip to Cape Disappointment State Park where we spent an hour touring the small, yet impressive Lewis and Clark Interpretive Center. 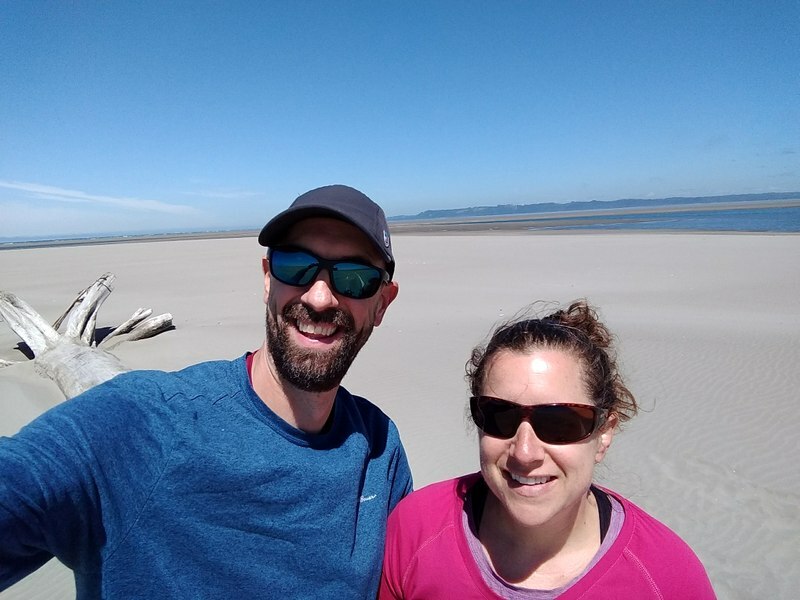 These two intrepid explorers along with their crew ended an exhaustive journey of discovery at the mouth of the Columbia River over 200 years ago. The interpretive center takes you on a pictorial and written journey that parallels their route to the Pacific. I found it especially fascinating because we have visited so many of the places where they stopped along the way. 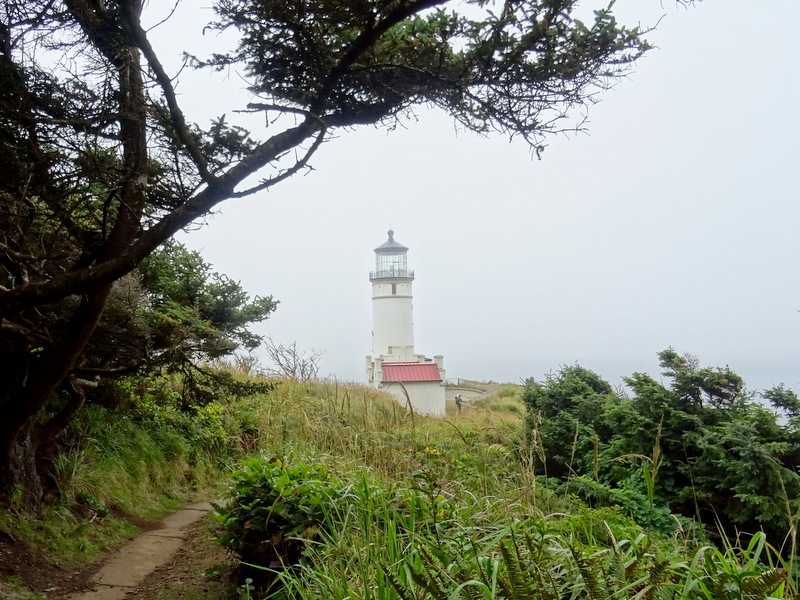 After the museum, we hiked through the forest to see the Cape Disappointment Lighthouse. Our stay in Long Beach coincided with our anniversary. Seven years married and a total of 15 years together! Crazy right? Neither of us are big on celebrations, but we wanted to do something to acknowledge this milestone. 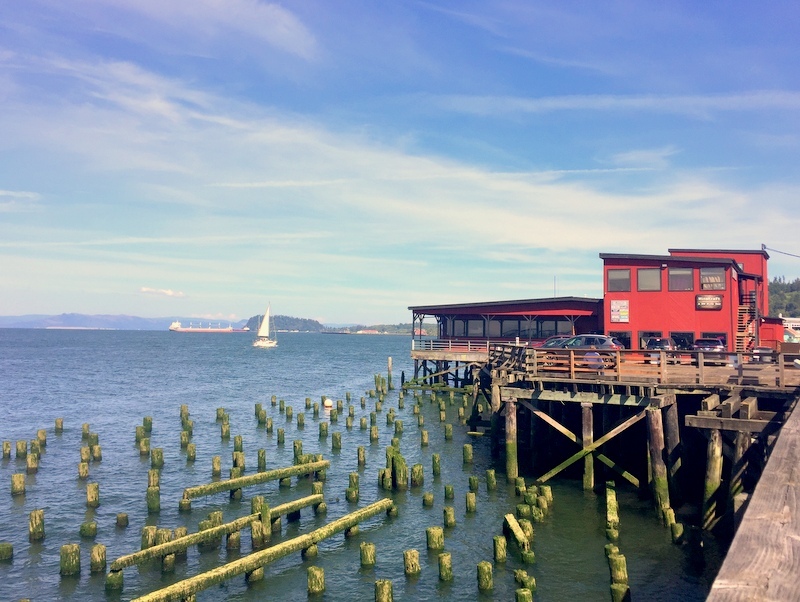 After debating the merits of all the restaurants on the peninsula, the decision was made to drive over to Astoria for some beer and pizza at Fort George Brewery. Some might not consider this a romantic night out worthy of an anniversary, but it was just perfect for us. I think the reason why we don’t feel the need to do special things on birthdays and anniversaries is that we’ve arranged our lives in such a way that every day feels special. Instead of treating these occasions as an opportunity to leave behind the stress or dullness of everyday life, we think of them as a time to reflect on where we are, how we got here, and how grateful we are to be embarking on this amazing journey with each other. Happy Anniversary to us! Forgot to take a photo together so this us + food compilation will have to do. Fort George was an excellent choice. 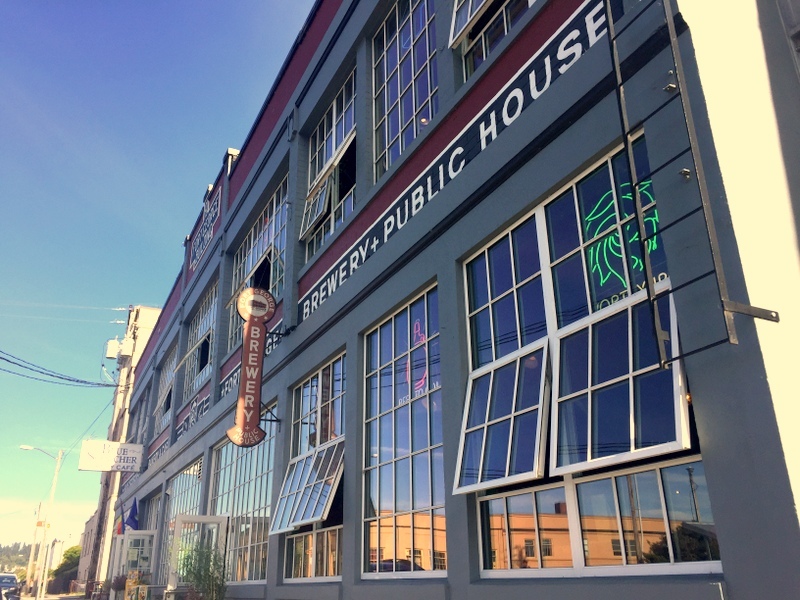 This very large brewery is located in an old warehouse that takes up an entire city block. They have a bakery, a pub, a tasting room, and an upstairs restaurant serving delicious wood-fired pizza. Oh, and they also have great beer. We shared a tasting flight, and while they were all good, hands down our favorite was the 3-way IPA. This hazy citrus-infused east coast style IPA was one of the best of this type we’ve tried. If you’re like me and think you don’t like IPAs, do yourself a favor and seek this one out. Not bitter and with a heavenly aroma, it’s sure to win over even the most reluctant IPA drinker. Coming in a close second was the fruit beer called Me, Myself & Pie. With a strong flavor of marionberries combined with a hint of pie crust (they actually put pie crust in the beer!) it was like drinking a slice of pie. Sadly, this was a seasonal offering that is no longer on their website. Maybe they’ll bring it back next summer. 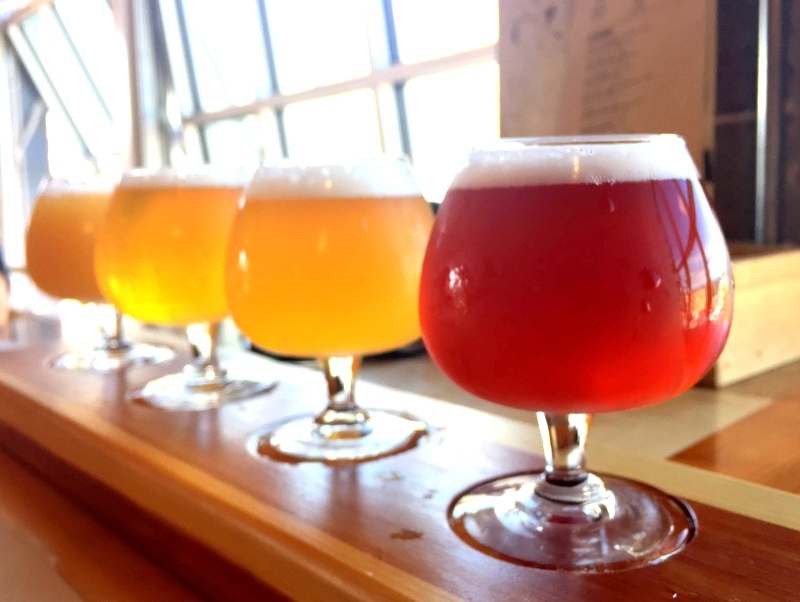 A delicious beer flight – the one in front is Me, Myself & Pie which really tasted like pie! And that wraps up our 10-day stay in Long Beach, WA. This tiny, perpetually foggy, on the way to nowhere peninsula really won us over. 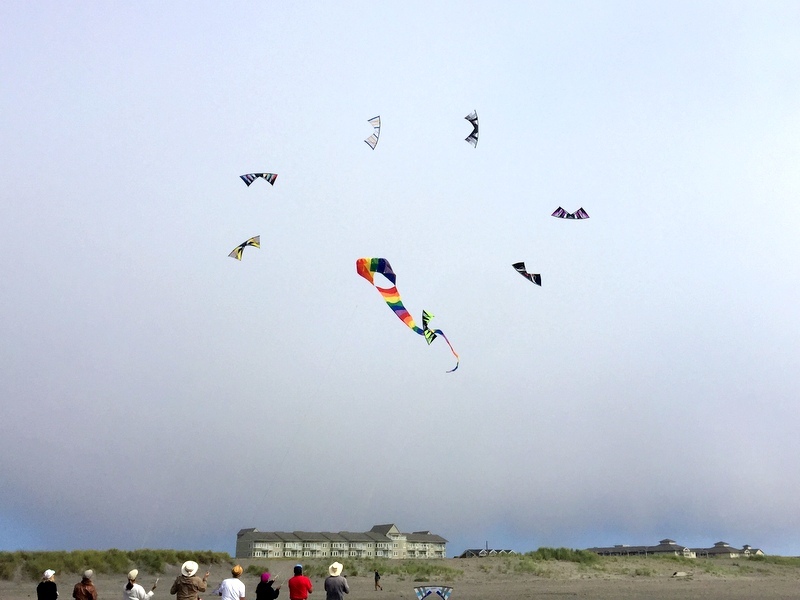 We enjoyed the laid-back vibe so much that we might just try to return next year for the kite festival. 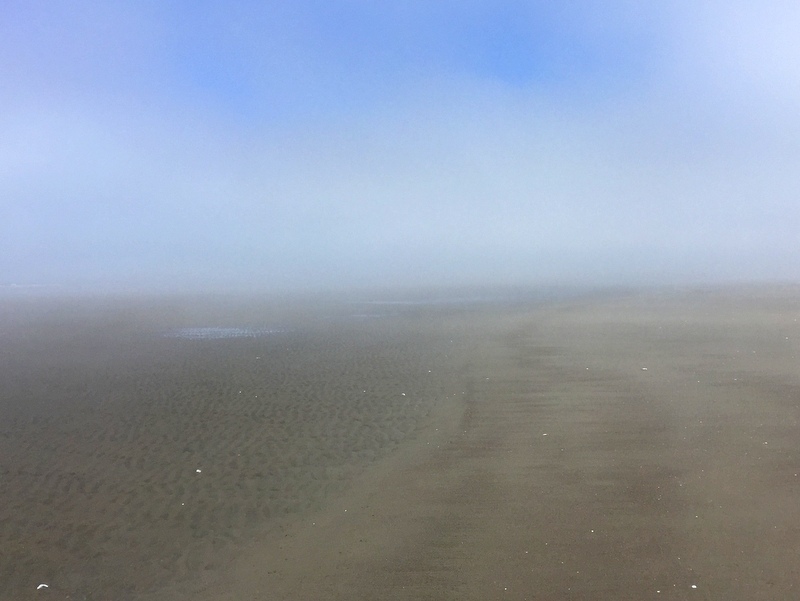 After all, with everywhere else in the west else guaranteed to be hot and on fire by mid-August, the foggy coast is probably the best place to be. Appreciate your posts. 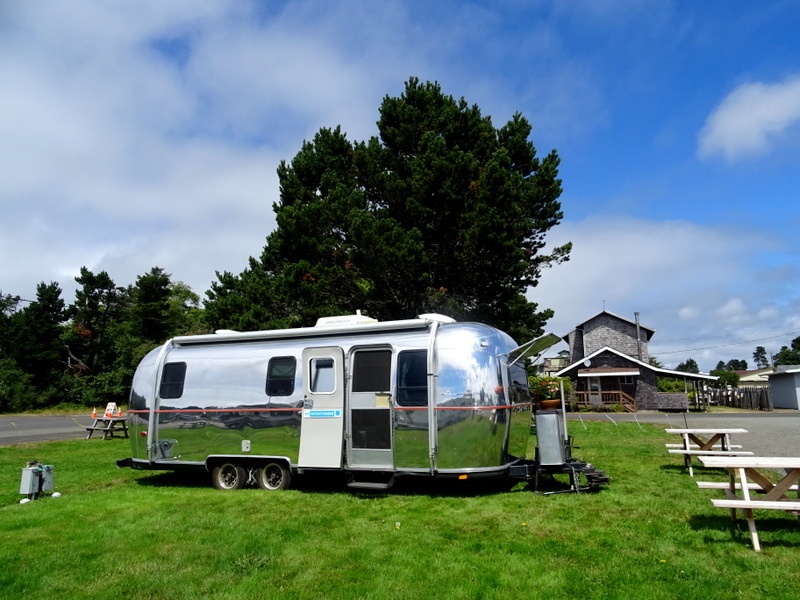 We too are in Oregon and have found it very hard to find a good RV site without some prior planning. It is certainly a busy area! A few years ago we had luck finding last-minute spots on the Oregon coast, but it was late in the fall after all the kids were back in school. 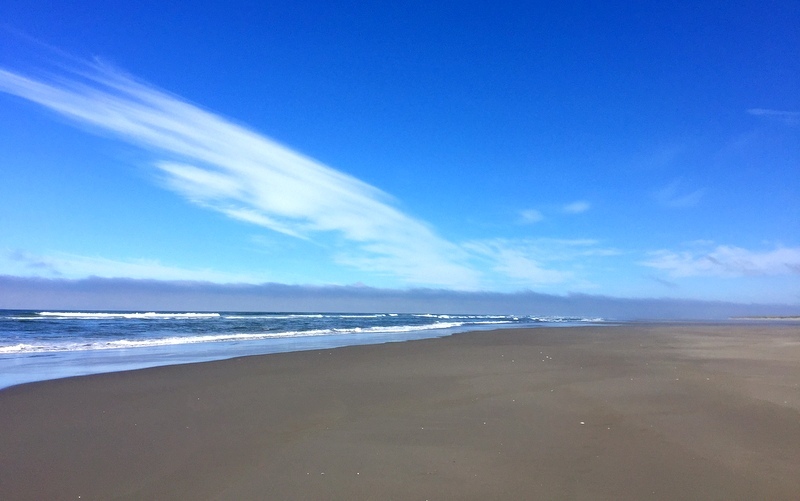 We too loved our stay on the Long Beach Peninsula. 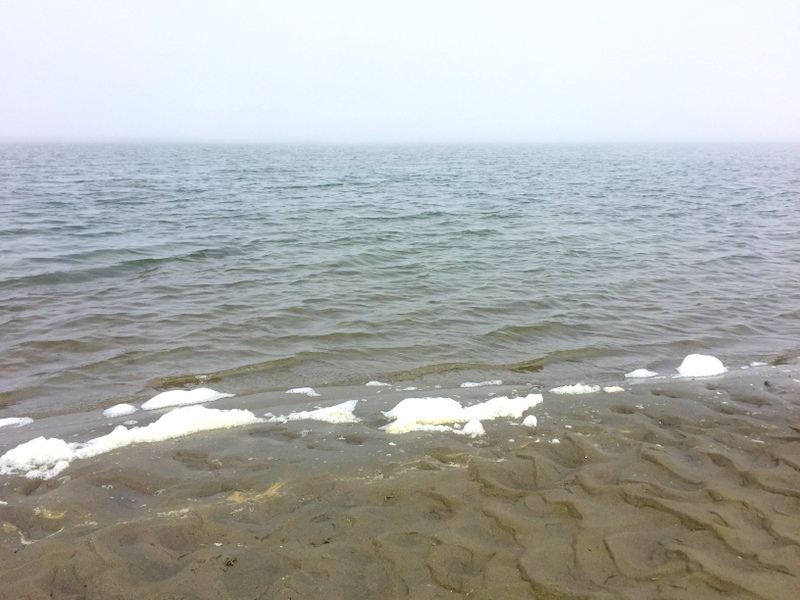 It’s such a trip to walk a beach completely enshrouded in fog! And so refreshing to find beaches free of mobs of people! The crazy part is how fast the fog moves in and out. One minute it’s clear and the next you can’t see more than 5 feet in front of you. The lack of crowds on the beach was so nice after our time in So. California this spring! Wonderful pics of the empty beach! I love foggy and damp days so this area really calls to me. The Lewis and Clark center is one of my favorites – both the setting and the offerings. Happy Belated Anniversary and best wishes for many, many more years of special everydays. Happy Anniversary! Fortunately we had a few days of postcard perfect weather for our visit. 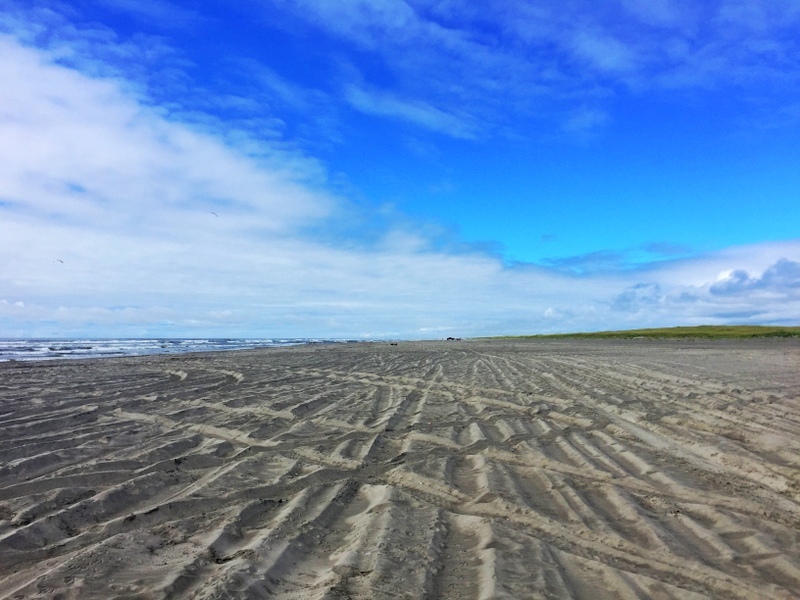 The wide expanse of sandy beach and the lack of tourists was just a wonderful experience. Kinda would have liked to have some of that famous fog, thanks for getting that thought out of head! You got lucky with the sun! While the fog was scenic at times, I definitely found myself missing sunshine. No complaints about the empty beaches though! Sand and Fog…what a great post title! We loved Long Beach, too, but we were there in early spring, with plenty of sunshine. I think the hotter it is inland, the more fog there is on the coast. Doesn’t matter—it’s beautiful, no matter what! That long hike you did on the beach looks so peaceful. What are your creative plans for all of those sand dollars? 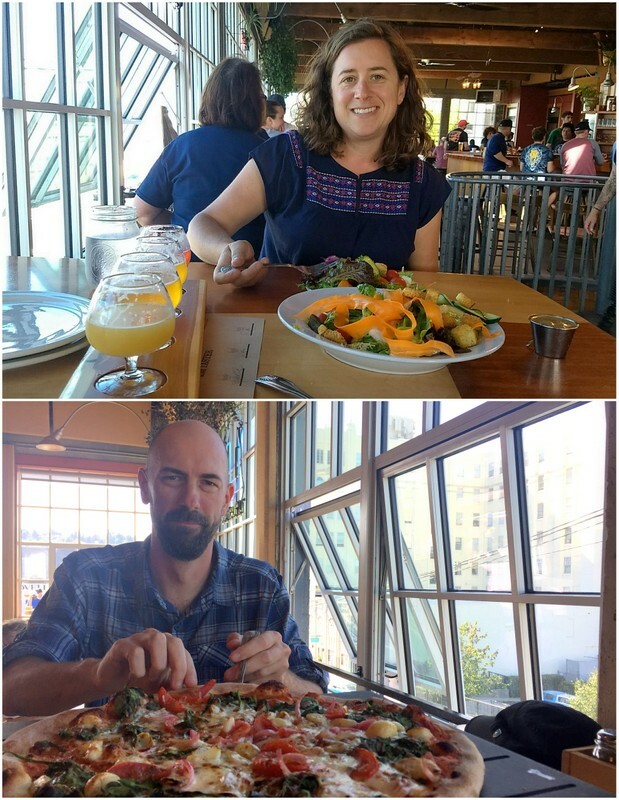 We also loved Fort George—the bakery, the restaurant, the brewery—so many goodies. I got addicted to that bakery! Happy Anniversary to you two, and wishing you many more years of adventures together! 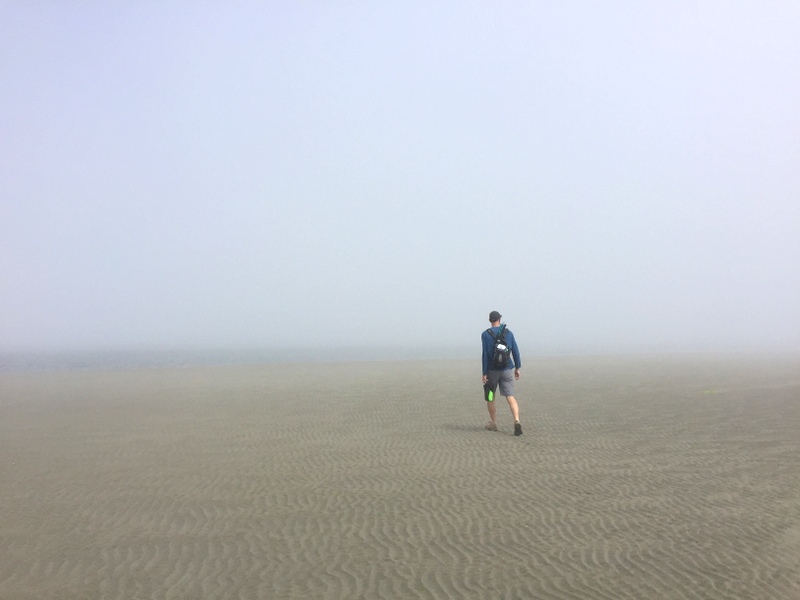 The connection between inland heat and fog on the coast totally makes sense because during our stay there was a serious heatwave happening around much of the PNW. We have some ideas involving molds and clear resin as a way to preserve the sand dollars. The ones we collected several years ago all broke so we need a better way to keep and display them. It was probably for the best that we were staying 40 minutes from Fort George. Otherwise, I would have been there every day! 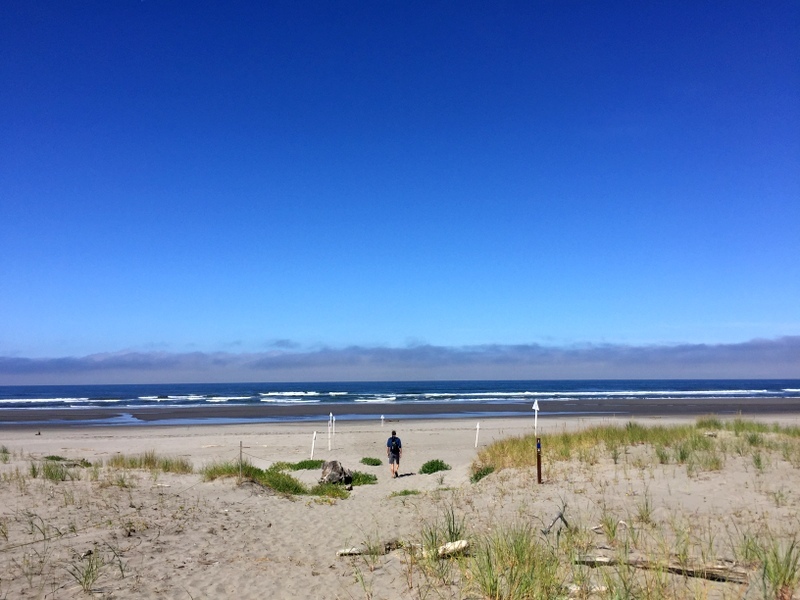 Loved your post of Long Beach, WA! We camped there for 5 days in May 2017. We ate fish and chips at the Bowpicker in Astoria, OR. It was the best fish and chips we ever ate! On your return, you gotta go there to eat. People line up early! Oh yum! I love a good fish and chips. Putting Bowpicker on the list for next time. Thanks for the recommendation.